What is a spirometer? 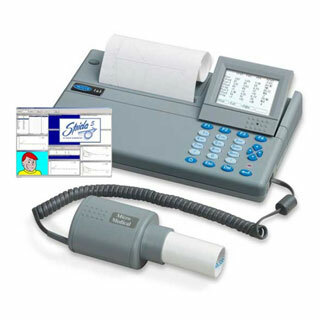 A spirometer is a device used by medical professionals to measure a patients lung functions. It is essentially used for diagnosing lung related illnesses (asthma, emphysema, etc.) or evaluating pre-existing lung conditions. Spirometry measures air movement which allows your doctor to determine the health of your lungs by recording the quantity and rate of air that is inhaled and exhaled. The spirometer apparatus will output the results so the acting physician can interpret them and compare them to the data of other types of specific illnesses.